(931) Earth is not an isolated system. Earth is a part of the universe. All the heat on Earth come from Earth's own tectonics and the Sun's radiation. The Sun of course, converts matter into energy. The greenhouse effect simply makes the space a bit cooler and Earth's surface a bit warmer through the re direction of some of the outgoing IR back down. However, one should note that the greenhouse effect does not, as scientists claim, make Earth 33 C warmer than it would be otherwise. Because, Earth is not a black body, Earth itself is a heat source. (931) The greenhouse effect is energy neutral. This is because the greenhouse effect affects the Earth as well as the space. It warms the Earth a little bit at the expense of cooling the space a little bit. Of course, the space is so big the effect on the space is not measurable. The effect on Earth is also very small, at most a few C.
The greenhouse effect is energy neutral. This is because the greenhouse effect affects the Earth as well as the space. It warms the Earth a little bit at the expense of cooling the space a little bit. Of course, the space is so big the effect on the space is not measurable. The effect on Earth is also very small, at most a few C.
So you believe "greenhouse effect" can, and does, violate Planck's Law? No substance can affect thermal radiation. Temperature is the only determinant. Why do you keep repeating this crap? The methane looks completely black at this IR wavelength, even though it's at about the same temperature as the surrounding gases. That's because it's methane! Surface Detail wrote: Why do you keep repeating this crap? Like I said, I realize you think actual science is crap. I happen to disagree. I repeat it as often as I do in response to the repeated violations of Planck's Law that people assert. You might catch on to the pattern. 1. Someone expresses a violation of Planck's Law in the name of "greenhouse effect." 3. You complain that my response hasn't changed to the assertion that hasn't changed. Surface Detail wrote: Planck's Law describes the emission spectrum of an ideal blackbody. ...and to the best of your understanding, since there is no such thing as an ideal blackbody in nature, you believe that Planck's Law just simply doesn't apply to anything, yes? That's a rookie mistake. It's like the people who get desperate in defending Global Warming and try to claim that the laws of thermodynamics somehow don't apply because the earth "isn't a closed system." The error is in not understanding applicability. The laws of physics apply always, everywhere. If you remember that golden rule you'll make great strides in avoiding silly pitfalls. The reason for Planck's Law being about an ideal blackbody is to generalize the equation, nothing more. Naturally all bodies have differing emissivity, for example, but the relationship of Planck's Law holds in all those individual cases. IBdaMann wrote: Planck's Law is very easy to understand: Temperature determines thermal radiation. That's not explaining Planck's Law. He leaves out that it's a function of wavelength (or frequency). I believe I beat you to it. Check a couple of posts up. (592) IB STILL hasn't explained what Planck's Law means. He just thinks he has. Just more vague hand waving that it applies to everything and more asserting that the greenhouse effect 'violates' it. IB STILL hasn't explained what Planck's Law means. Just more hand waving that it applies to everything and asserting that the greenhouse effect violates it. While solid objects are usually approximate blackbodies, gas at atmospheric pressure is nothing like a blackbody! Its ability to absorb and emit infrared radiation is strongly dependent on molecular resonances and hence the composition of the gas. Why do you think the methane leak in the video I linked to shows up black? What you are doing is the equivalent of insisting that a rock and a feather will always fall at the same rate under any circumstances because of Newton's laws, while refusing to acknowledge that this is only true in a vacuum. IBdaMann wrote: Atmospheric composition has no role in atmospheric temperature. What's ironic is that he is accusing you of "not understanding applicability" when it's him who has no idea. Yes, it's quite hilarious. Having once had the dubious pleasure of attempting to teach basic physics to bottom set high school students, I'm familiar with the mentality. Some people simply don't have the capacity for abstract thought that science requires, but are still convinced they know it all because they can parrot a few laws or equations. They come out of exams all confidence and smiles, then cannot understand why they failed when the results come out. Surface Detail wrote: You really don't get it, do you? Yes, I get it. What part do you need explained to you? Surface Detail wrote: While solid objects are usually approximate blackbodies, gas at atmospheric pressure is nothing like a blackbody! The body in question is earth. Is there anything else you need explained to you? Surface Detail wrote: Its ability to absorb and emit infrared radiation is strongly dependent on molecular resonances and hence the composition of the gas. The atmosphere's temperature is not dependent upon the ability to absorb and emit infrared radiation of one of its components. Shall we walk through the thought experiment? Surface Detail wrote: What you are doing is the equivalent of insisting that a rock and a feather will always fall at the same rate under any circumstances because of Newton's laws, while refusing to acknowledge that this is only true in a vacuum. Yes, we're perfectly aware that the Earth's surface is an approximate blackbody. What we're concerned with though is the transmission or otherwise of radiation through the atmosphere. The emission spectrum of the Earth as viewed from outer space deviates substantially from that of a blackbody due to selective absorption of radiation by the gases in the atmosphere. By the way, I notice you keep EVADING my question about the methane leak. Why do you think it shows up black in the IR video? 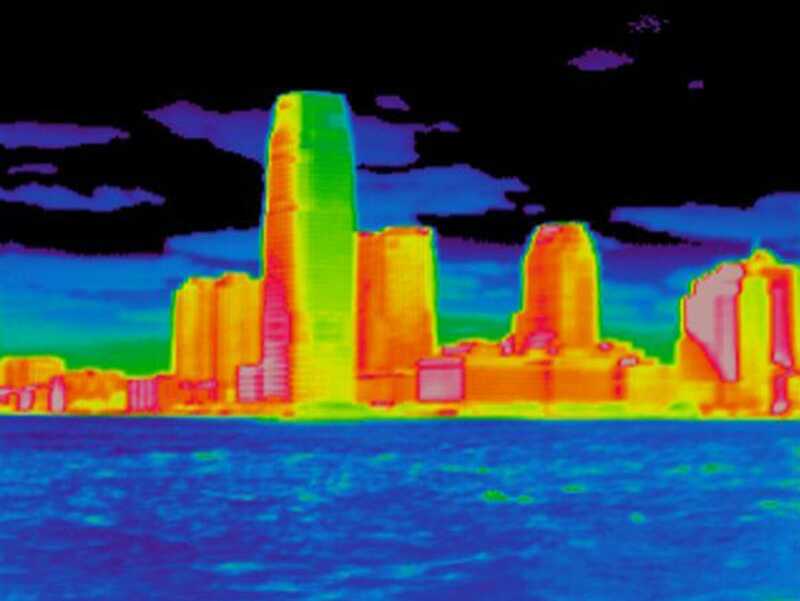 (931) This is a thermal image of city and the sky above it. The hottest things are the buildings. The clouds and the ocean are also visible and much cooler. The atmosphere itself, however, does not show up on the thermal image, possibly because air molecules are too sparse to be seen. It is possible the methane leak Surface Detail mentioned is visible on thermal because the methane plume coming out from well below the ground is already very hot because, as we know, it is very hot below the ground. This is another thermal image, showing hot gas coming out of a chimney stack. Surface Detail wrote: Yes, we're perfectly aware that the Earth's surface is an approximate blackbody. This leads me to think you don't understand, or you don't accept, that the earth is a body. Naturally we need to get you over this hump before we can proceed. Surface Detail wrote: What we're concerned with though is the transmission or otherwise of radiation through the atmosphere. What concerns us is accounting for additional energy. The 1st LoT is very clear; energy can neither be created nor destroyed. This rule applies always, all throughout the universe. If someone claims that "greenhouse gas" increases temperature then we need to account for this additional energy that "greenhouse gas" provides. It's all about the accounting. Surface Detail wrote: The emission spectrum of the Earth as viewed from outer space deviates substantially from that of a blackbody due to selective absorption of radiation by the gases in the atmosphere. Earth, as a body, radiates per its temperature. Earth's atmosphere radiates per its temperature. Check Planck's Radiation Law. All things radiate per their temperature per Planck's Radiation Law. So when someone like you implies that earth's atmosphere somehow radiates differently because of a change in material composition, you are implying that earth's atmospheric radiation is determined by something other than just temperature, which implies that earth's atmosphere does not radiate per Planck's Law. Surface Detail wrote: By the way, I notice you keep EVADING my question about the methane leak. Why do you think it shows up black in the IR video? I'm not EVADING it as much as I am simply not bothering with it. It is completely irrelevant. It does not help you account for the additional energy you claim "greenhouse gas" provides. See the big chunks missing from the Planck distribution? That's where greenhouse gases have absorbed the outgoing radiation. The methane leak is relevant because if what you said were true, the methane plume would appear the same as the atmosphere around it, i.e. transparent. Surface Detail wrote: As I've explained on multiple occasions, the Earth's atmosphere does indeed not radiate per Planck's Law. Then we're done. That's all you need to say. You assert that "greenhouse effect" increases earth's temperature by leveraging the fact that the earth's atmosphere does not radiate according to Planck's Law, and can thus increase the atmosphere's temperature by regulating the atmosphere's thermal radiation. I simply disagree. I claim that all of nature adheres to Planck's Law and that what you are asserting is a violation of physics. Is there anything else that needs to be discussed? (931) You cannot consider Earth without considering the rest of the universe. Your claim is complete nonsense. Planck himself specified that his law applied specifically to the emission of radiation from blackbodies, and atmospheric gases are nothing like blackbodies. The graph I showed is the result of actual measurements of outgoing radiation. 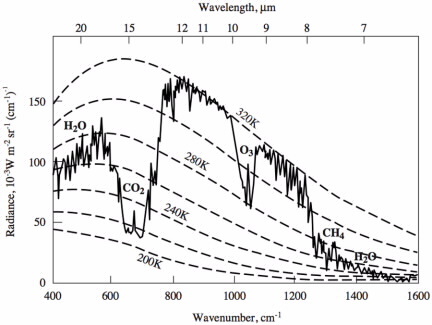 It shows that the IR radiation from Earth obviously deviates from a blackbody spectrum. Your flat denial of experimental evidence is the antithesis of science; it is pure dogma. (931) This is an explanation. I think what they are saying is, can a human body heat a hot pot by IR radiation? The answer, at least I think, is no. This is why they say IR from colder CO2 high up in the sky cannot heat the much hotter ground and the air near the ground. What they essentially say is, hotter things can heat colder things, colder things cannot heat hotter things. If anyone can shed some light on this, I would greatly appreciate. Surface Detail wrote: Your claim is complete nonsense. Is that a "you agree" or a "you disagree" with my synopsis, i.e. ...and no one has yet shown it to be false. Surface Detail wrote: his law applied specifically to the emission of radiation from blackbodies, and atmospheric gases are nothing like blackbodies. So, to the best of your understanding of science, you believe Planck's Radiation Law does not apply to earth's atmosphere, yes? That's all you need to say and it explains a lot about why you are convinced that "greenhouse effect" is real. Surface Detail wrote: Your flat denial of experimental evidence is the antithesis of science; it is pure dogma. Could I get you to go on record as stating that my belief that "earth's atmosphere radiates according to Planck's Law" is pure dogma? illustrating the fact that the emissions from the Earth's atmosphere don't follow the blackbody curve corresponding to Planck's Law. Not that anyone would expect them to, given that the atmosphere is not a blackbody! Flat denial of experimental evidence is dogma. (931) Let's suppose the atmosphere has no IR active gases whatsoever. Let's suppose every CO2 and H2O and CH4 and N2O and O3 air molecule turns into an O2 air molecule. What would be the temperatures at day and at night at the equator? Let's suppose the atmosphere has no IR active gases whatsoever. Let's suppose every CO2 and H2O and CH4 and N2O and O3 air molecule turns into an O2 air molecule. What would be the temperatures at day and at night at the equator? What temperature is it now at the equator? About 30 C at day. About 25 C at night. All year round. It's hard to say. On average, the Earth would be about 33 C colder than now, but the difference would be greater at the poles and less so at the equator. So, while the equator would indeed be colder, temperatures wouldn't be anywhere near 33 C colder. The poles, on the other hand, would be more than 33 C colder than today. That's speaking off the top of my head. It may be possible to find detailed estimates somewhere on the Internet! Tai Hai Chen wrote: About 30 C at day. About 25 C at night. All year round. So if earth's current atmosphere were substituted for a different atmosphere of equivalent mass (to retain the same atmospheric pressure and transparency to visible light) consisting of only nitrogen and oxygen, the new temperature at the equator would be about 30 C at day. About 25 C at night. All year round. That's not what you want to hear/read, correct? Surface Detail wrote: It's hard to say. On average, the Earth would be about 33 C colder than now, but the difference would be greater at the poles and less so at the equator. This too is based on his unshakable belief that Planck's Radiation Law somehow does not apply to earth's atmosphere and that energy can be generated by getting nature to confuse cause/effect and to begin regulating temperature by controlling thermal radiation. Surface Detail wrote: That's speaking off the top of my head. No, that's not from where you pulled that. (592) Surface Detail, you should already know that trying to discuss science with Sky Dragon Slayers will do your head in. Especially the psychopathic ones off their meds. Flat conclusion of experimental evidence is dogma. Flat denial of experimental evidence without showing the reasoning is just an argument of the Stone. This graph does not disprove Planck's law at all. Nothing says that the atmosphere can't filter out certain wavelengths. Any energy absorbed by such a filter is simply converted to the overall emission (another wavelength). Surface Detail, you should already know that trying to discuss science with Sky Dragon Slayers will do your head in. Especially the psychopathic ones off their meds. IBdaMann claimed that the Earth's atmosphere emits radiation in accordance with Planck's Law. Satellite measurements show that it doesn't. This is exactly what you'd expect, because the Earth's atmosphere is not a blackbody, and Planck's Law only applies to blackbodies. Clear now? Planck's law applies everywhere...all the time...there are no exceptions. You do not understand Planck's law. I have already described why the notches do not disprove the law. IBDaMann is correct. You've easily demonstrated that IBDaMann is as thick as two short Plancks. You've easily demonstrated yet again that you have nothing to contribute to the conversation. What conversation? You and IBdaMann kill any rational conversation by trashing every thread with your delusional Sky Dragon Slayer pseudoscience drivel. Ceist wrote: What conversation? You and IBdaMann kill any rational conversation by trashing every thread with your delusional Sky Dragon Slayer pseudoscience drivel. It's too bad that you don't understand the nature of discussion forums. You can't tolerate discussion because you can't tolerate differing viewpoints. You are so insecure in your beliefs that you refer to differing viewpoints as "trolling." You want to kill discussion, not further it, as is evidenced by your complete lack of substantive contribution in any forum. In your world, science is the enemy, math is the enemy and ideas are the enemy. Why anyone would choose the religion you have chosen is beyond me. It is you, IBdaMann, who are the slave to religion. I have shown a graph of experimental measurements indicating that the Earth's atmosphere does not radiate according to Planck's Law. You ignore this and keep insisting that it does. Denial of experimental observations is not science. It is religion. I used to waste a lot of time trying to explain in detail to dogmatic Creationists who insisted that evolution violates the second law of thermodynamics, why the claim made no sense. They would ignore everything and just keep insisting that it does and that I was denying science. I gave up trying to explain anything to people with ideologically induced stupidity like IBdaMann. It doesn't matter how much you explain or how much evidence you provide they just ignore it and repeat the same scientifically illiterate dogma over and over again.